People have called and verified the numbers and it’s burning up social media now. 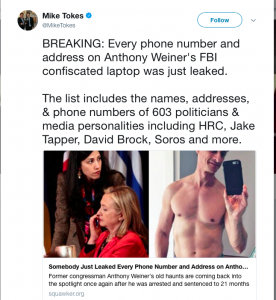 I double checked some of the names and the numbers are real, such as Soros’ number. Not going to link you to the site that actually lists all the contacts of 639 media personalities and politicians. You can go yourself if you choose. 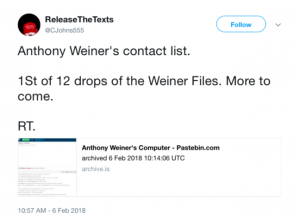 Everyone is doxxed from Soros to all Hillary’s numbers and addresses. Don’t download anything or you may have trouble. But it stands to reason it came from an FBI leak since they are the people who hold the laptop now. There’s a suggestion that the people who leaked may have more of the files that were on the laptop and intend to leak them. Hard to know if that’s true or that’s just someone spinning on the internet. But this may have been a ‘good faith’ drop, i.e. proof that if they say they have more, they do.